Brother has been producing high-quality business laser printers and one of its notable models is the DCP 145C, which is designed for small business and home users. The device uses four separate Brother DCP 145C ink cartridges, producing high-quality prints. The printer is a compact unit with attractive looks and can fit into any work environment, allowing users to save space. The device weighs 7.1 kg approx. measuring 390 x 150 x 365 mm.It has a control panel at the top with a small monochrome display screen. It also features CIS flatbed scanner and copier located at the top. The printer also has a PictBridge port, and this enables you to print from a PictBridge compatible camera. The bottom end of the device has input tray and output tray which can store up to 100 sheets and 50 sheets of paper respectively. It is capable of printing on different print medias such as card stock, transparencies, labels, photo paper, glossy paper, envelopes, matte paper. The printer runs on 32MB of memory and connects to a PC via high-speed USB 2.0. It allows users to scan directly to a memory card or use the OCR feature for editable scanned documents. The printing resolution of this device is up to 1,200 x 1,200 dpi for monochrome files and 1,200 x 600 dpi for colour documents with the print speed of 27 ppm and 22 ppm respectively. The device is compatible with Windows and Mac operating systems. Brother DCP 145C is a good quality photo printer with print, scan and copy functions. The device supports a wide variety of print media and produces quality outputs with great printing speed. Its direct printing features help users to save time. The separate Brother DCP 145C ink cartridges comes with an affordable price and yields better-looking output. However, its small display status screen, lack of fax support, ADF support and automatic duplexing does not make it a good choice as compared to its other competitors lying in the same class. Why are the ink cartridges running out very quickly? The Brother DCP 145C printer is known for its high-quality printing. The printer is an all rounder and a set of Brother DCP 145C ink cartridges are shipped along with it.The printer offers good features and therefore is ideal for home and office users. After a certain period of use, you would notice that the ink cartridge has run out pretty fast. A set of new Brother DCP 145C ink cartridges can be purchased online in case this happens but it is important to know the root cause of the problem. The reason for quick ink run outs may be in the ink cartridges as well as the printer. When you buy a new Brother DCP 145C printer, you get a set of Brother DCP 145C ink cartridges along with it. These started ink cartridges are inclusive of the cost of the printer. If you do not install this starter Brother DCP 145C ink cartridges for the first time and instead use loosely purchased ink cartridges, you might face the problem of quick ink runout. The reason to this is, when you install ink cartridges for the first time in a new printer, some extra ink from the cartridges is used to fill up the delivery tubes. This is a one-time process. The starter ink cartridges have that extra amount of ink present in them. So after the fill of the tubes, the amount of ink left in the starter cartridge is equal to that of a new cartridge. Therefore the ink cartridge will not last as long as specified. There is a possibility that you often print high-quality documents and photos. Such prints use more amount of ink hence quick ink runouts. The printer is designed to run periodic cleaning cycles of the print head. This process uses some amount of ink. So even if you have not been printing regularly, ink from the cartridge is being used to keep the head nozzles clean. Q. What types and sizes of paper can I use with a Brother DCP 145C printer? A. You can use plain paper(A4, A5, A6), letter paper, legal paper, inkjet paper (coated paper), glossy paper, transparencies, envelopes( commercial No. 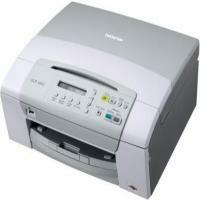 10, DL, C5, Monarch, JE4), photo paper( 10 x 15 cm), index cards and postcards with this printer. Q. How will I come to know that the ink levels of my Brother DCP 145C ink cartridges are running low? A. Your Brother DCP 145C printer is equipped with an ink dot counter. The ink dot counter automatically monitors the ink levels in all the 4 ink cartridges. When the ink cartridge levels are running low, your printer will notify you with a message on the LCD screen. The LCD will tell you which ink cartridge is running low or empty. Make sure to follow the LCD prompts to replace the ink cartridges in the right order. Q. Will the use of Brother DCP 145C ink cartridges invalidate my printer’s warranty? A. Absolutely not! Our compatible Brother DCP 145C ink cartridges are of high quality that have been factory tested and certified. Using these ink cartridges with your printer will not cause any problems to the printer and the printer’s warranty will remain valid. Q. Do you accept cash on delivery for items purchased from your website? A. Unfortunately, we do not have a cash on delivery service yet. You can pay for the products you wish to buy using PayPal or by using Laser Card, American Express, MasterCard or Visa credit card, Maestro, Switch, Solo or Delta debit card. Q. How long would it take for Brother DCP 145C ink cartridges to be delivered to me in Limerick? A. If you place an order for any of our products before 12 noon, the product will be delivered to you within 1 - 2 days. If your order is urgent and you require the product to be delivered to you faster than the standard delivery time, you can contact us on 048 30833221 and we will try our best to deliver the product as fast as possible. Q. What should i do if the print speed is very slow when I use XML Paper Specification Printer Driver? A. If the performance level becomes unacceptable, then use the normal Brother printer driver that was supplied with your machine or is available on the Brother Solutions center download page. Q. For what reason does my machine's LCD indicate 'No Cartridge' despite the fact that I have just introduced all the ink cartridges? If you have followed this technique and still have a similar blunder, ensure you are utilizing excellent supplies. Low ones can cause this error condition. Q. Is there any difference seen in the print quality when I utilize compatible one for my printer? A. No, there is not really any difference noticed as we provide the best compatible Brother DCP 145C ink cartridges for your printer. All of our cartridges are tried and tested to the most highest quality norms to give you an indistinguishable quality printouts as you get while utilizing the comparable certifiable cartridges. Q. How do I replace my Brother DCP 145C ink cartridges? Open the ink cartridge cover. If one or more ink cartridges are empty (for example Black), the LCD displays "Cannot Print (Replace BK Ink)" or "B&W Print Only". Press down on the release lever to unlock it and take out the ink cartridge for the colour indicated on the LCD. Open the Brother DCP 145C ink cartridge bag for the colour indicated on the LCD, and then take out the ink cartridge. Turn the green knob on the protective yellow cap clockwise to release the vacuum seal, then remove the cap. You must hold the ink cartridge keeping its ink supply port pointing upwards. Each colour has its own correct position. Insert the ink cartridge in the direction of the arrow on the label. Gently push in the Brother DCP 145C ink cartridge until it clicks, and then close the ink cartridge cover. The machine will automatically reset the ink level. Note: Keep the printer on while reinstalling the cartridges otherwise it will not detect the cartridges. Q. Hi, I am from the NYC and would like to buy these compatible multipack of COMPATIBLE BROTHER A LC980 cartridges. But, I am not sure if you would be able to deliver these here in the NYC. A. Unfortunately, this would not be possible as we only deliver to addresses within Rep.Ireland & Northern Ireland. Q. How to fix the paper jam issue in my Brother DCP 145C printer? Turn the machine around and open the Jam Clear Cover. Look inside the machine and remove any jammed paper. Close the Jam Clear Cover. Make sure the cover is closed properly. Pull the paper tray completely out of the machine. And, Look at the inside of the machine where the paper tray was. Using your hand, lift the front of the machine approximately 150 mm (6 in.) off the surface. Now, remove any ripped paper you found in-between each of the black exit rollers. To remove the small pieces of paper, you can use a pair of tweezers. Note: Please be careful not to touch or scratch the internal part with your hand or tweezers. Lift the Scanner Cover (1) to the open position using the finger hold handles located on the right and left side of the cover. Use your hand to move the printhead and remove any pieces of paper remaining under the print head. Carefully check the left and right side corners and remove any pieces of paper. Note: if the print head is at the right corners, you cannot move the print head using your hand. Plug the power cord back into the AC power outlet (electrical socket). Hold down the Stop/ Exit until the print head moves to the middle so that the right-hand corner can be checked. Caution: If ink gets on your skin, immediately wash it off with soap or detergent. Lift the scanner cover to release the lock. Gently push the scanner cover support down and close the scanner cover using both hands. Now put the paper tray back into the machine. Make sure you pull out the paper support until it clicks and then unfold the paper support flap. Now, plug the power cord back into the AC power outlet (electrical socket) and verify the error message is cleared. Q. Do I have to replace all my Brother DCP 145C ink cartridges if any one of them run out of ink or I can replace the individual one? A. No, there is no need to replace all four cartridges for your Brother DCP 145C printer model if any one of them runs out of ink. You can individually replace the Brother DCP 145C ink cartridge which has gone empty. This is an extra benefit with the Brother DCP 145C printer which helps in reducing ink wastage.